Stowe Wine & Cheese is adding something new to its offerings later this month. Swirl wine bar, an in-store tasting café, will invite customers to sample wines by the glass, paired with an assortment of cheeses and other items. Last July, Ken and Sandie Powers purchased and renamed the former Mountain Cheese and Wine, which had enjoyed 40 years of business. With a reputation to uphold, Stowe Wine & Cheese continues to well more than a thousand wines from around the globe, 50 kinds of local and imported cheeses, charcuterie, and other Vermont-made delicacies. 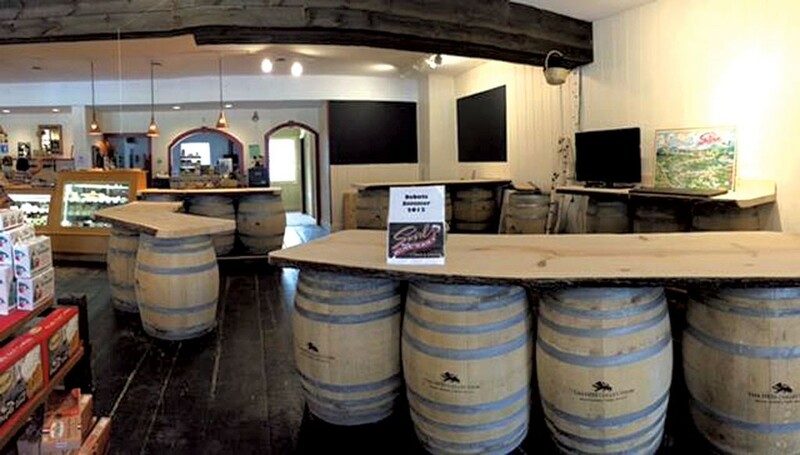 Swirl will occupy the back of the store, where slabs of pine atop white oak wine barrels will form bar counters and a seating area. About 25 reds and 25 whites from the inventory will be available for six-ounce pours or flights of two-ounce tasting trios. Why open a wine bar inside a retail shop? "It's easy: Try before you buy," says Ken Powers. "Anything you taste at Swirl you can buy in the store." Along with the wines, cheese boards will contain three to five samples, as well as chutneys and spreads. A chart will help patrons select the perfect wine-and-cheese pairings. Swirl will also have two local beers on tap, ciders and hard root beer. Sandie Powers is currently cooking up the café menu, which she says will feature gourmet panini and Italian calzones. Swirl will be open seven days a week with varying hours. The original print version of this article was headlined "Give It a Swirl"